As most of you know, we travel a lot with our dogs Icy and Phoebe so we're always on the lookout for the best dog friendly places. I'm delighted to introduce you to Nichole, my Guest Blogger from DogVills . Nichole is the Editor In Chief at DogVills, a blog about all things dog, including dog training tips, dog health tips, dog news, dog recipes and more. 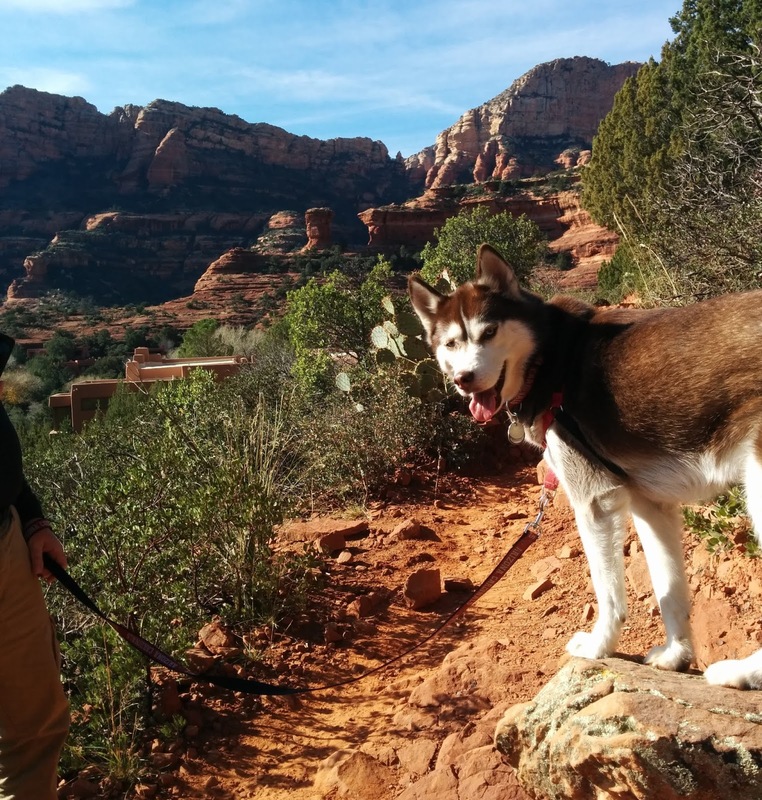 Nichole loves to travel with her dogs too and she has graciously offered to share some of the Most Popular dog friendly National and State Parks in the U.S. So, Take it away Nichole! "I love taking my dogs on outings with me! I’m always looking for places like hotels, restaurants and stores that allow dogs so that I can bring them with me everywhere I go! While I’m used to the challenge of finding indoor spaces that allow pets, I was shocked to discover how difficult it is to find dog-friendly national and state parks! Did you know that most parks either have very restrictive pet policies or ban them entirely? In some parks, you can’t even drive through the entrance with a dog in the car! Don’t worry, though, we’ve rounded up the top dog-friendly national and state parks in the United States to make planning a vacation with your pooch a little easier! There are 60 national parks and over 10,300 state parks in the United States. Together, they spread out across over 18 million acres! While the vast majority of them don’t allow dogs, there are a few that welcome our canine companions! Just remember that even the most dog-friendly national parks have rules about where you can take your dog. Make sure you learn and follow them, so these parks don’t have a reason to ban dogs entirely. Acadia National Park- Acadia National Park, established in 1919, is in the state of Maine, just southwest of Bar Harbor. The park sits on 49,075.26 acres and sees approximately 3,509,271 visitors annually. Arcadia National Park features an array of lakes, mountains, shorelines and woodlands. Badlands National Park- Badlands National Park, founded in 1978, is found in southwestern South Dakota, near Rapid City. The park sits on 242,755.94 acres and sees approximately 1,054,325 visitors annually. Several movies have been filmed in the Badlands National Park, including the 1990 Dances with Wolves, the 1997 Starship Troopers and the 2007 National Treasure: Book of Secrets. Cuyahoga Valley National Park- Cuyahoga Valley National Park, conceived in 2000, is based in northeastern Ohio, along the Cuyahoga River between Akron and Cleveland. The park sits on 32,572.35 acres and sees approximately 2,226,879 visitors annually. The national park features more than 125 miles of hiking trails, as well as an array of caves, rolling hills, waterfalls and winding rivers. Grand Canyon National Park- Grand Canyon National Park, originated in 1919, is set in northwestern Arizona, in Coconino and Mohave counties. The park sits on 1,201,647.03 acres and sees approximately 6,254,238 visitors annually. The park’s main feature is the Grand Canyon, a gorge that was carved out by the Colorado River. Great Sand Dunes National Park- Great Sand Dunes National Park, founded in 2004, is in south-central Colorado, in Alamosa and Saguache counties. The park sits on 107,341.87 acres and sees approximately 486,935 visitors annually. The national park is home to North America’s tallest sand dunes, reaching heights of 750 feet. Mammoth Cave National Park- Mammoth Cave National Park, formed in 1941, is situated in central Kentucky, in Barren, Edmonson and Hart counties. The park sits on 54,011.91 acres and sees approximately 587,853 visitors annually. The park surrounds parts of the Mammoth Caves, the world’s longest cave system, which measures 405 miles in length. North Cascades National Park- North Cascades National Park, created in 1968, is positioned in Washington, in Chelan, Skagit and Whatcom counties. The park sits on 504,780.94 acres and sees approximately 30,326 visitors annually. North Cascades National Park features an expansive glacial system, forested valleys, numerous waterways and rugged mountain peaks. Shenandoah National Park- Shenandoah National Park, established in 1935, is situated in Virginia, surrounding part of the state’s Blue Ridge Mountains. The park sits on 199,217.77 acres and sees approximately 1,458,874 visitors annually. Shenandoah National Park features some impressive waterfalls, ranging in height from 28 feet to 93 feet. Yosemite National Park- Yosemite National Park, founded in 1890 is set in California, in Madera, Mariposa and Tuolumne counties. The park sits on 761,747.50 acres and sees approximately 4,336,890 visitors annually. The world-renowned park is famous for its biological diversity, clear streams, granite cliffs and sequoia groves. Zion National Park - Zion National Park, conceived in 1919, is found in southwestern Utah, in Iron, Kane and Washington counties. The park sits on 147,237.02 acres and sees approximately 4,504,812 visitors annually. The park features 4 life zones: coniferous forest, desert, riparian and woodland. Abilene State Park- Abilene State Park is in Taylor County, Texas. The 529.4-acre park features camping areas, hiking trails, picnic areas and a swimming pool. Hot Springs State Park- Hot Springs State Park is in Hot Springs County, Wyoming. The 1,108.67-acre park features hot springs that constantly flow at a temperature of 135 degrees Fahrenheit. Huntington Beach State Park- Huntington Beach State Park is in Georgetown County, South Carolina. The 2,500-acre park is popular for its large sandy beach and countless wild birds. Itasca State Park- Itasca State Park is in Becker, Clearwater and Hubbard counties, within the state of Minnesota. The 32,690-acre park is home to more than 200 species of wild birds. Lost Dutchman State Park- Lost Dutchman State Park is in Pinal County, Arizona. The 320-acre park is named after the legendary Lost Dutchman Gold Mines. Oak Mountain State Park- Oak Mountain State Park is in Shelby County, Alabama. The 9,940-acre park is home to the Alabama Wildlife Center and the Oak Mountain BMX Track. Tuttle Creek State Park- Tuttle Creek State Park is in the state of Kansas. The 1,200-acre park features an artificial beach, camping sites and nature trails. 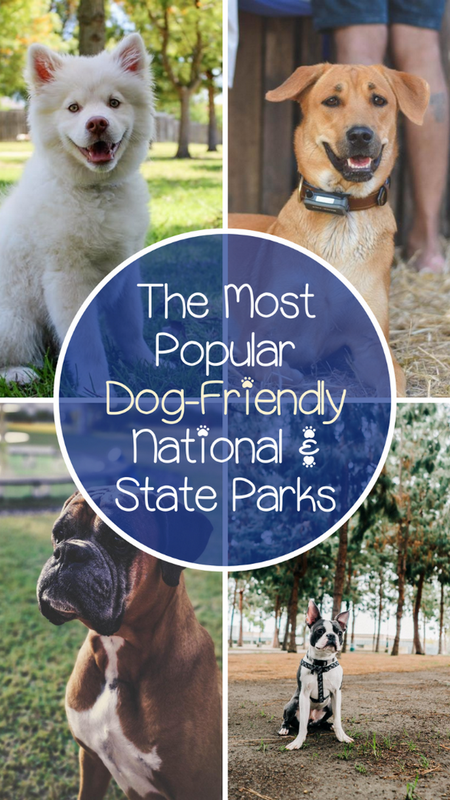 Remember, the rules vary at each of these dog-friendly national and state parks, so make sure you take the time to learn them! We want to be considerate pet parents so we don’t ruin the fun for anyone else." Thank You for sharing all this great pet travel information Nichole! It will be so helpful in planning dog friendly vacations to National and State Parks. I'm glad you included the point of following the individual rules for each of these parks, as they do vary and most have some restricted access for dogs. One example is that Grand Canyon National Park allows dogs but they don't allow them to hike down the canyon with you, dogs must remain up on the rim. I hope you enjoyed Nichole's dog travel post as much as I did. You can read more from Nichole on the DogVills blog. Happy Trails & Happy Tails!! You may also like these Icy and Phoebe approved DOG FRIENDLY TRAVEL DESTINATIONS! Have you been to any of these parks with your pet? Tell us about it in the comments, we LOVE hearing from you!! Thanks so.much for sharing Denise! Such a great list! Thank you and I also shared! Very helpful!! Thanks for sharing Joely! I'm glad you liked the list, I was happy to have it as a guest post. Jack loves running around parks, forests, woods and if we lived in the States I'm sure he'd love a chance to visit some of these listed. Yes, I'm sure he would enjoy any of these. I'm hoping to get to Acadia this Summer, if I do I'll surely be blogging about it! Hopefully we'll be in Acadia later this month. I know the dogs will love it! Oh how fabulous, I'm dying to go there! We are planning to go sometime this Summer as well - paws crossed! If you go I hope you'll blog about it, I'd love to hear all about your trip there. I love this post. It is so important for people to know where they can take a dog and not get yelled at or grumbled about. Dogs need some fun too! I have not been to any of these parks with our dogs, but I have visited several with family or friends. Fantastic list that I'll need to keep in mind for future travel ideas. Years ago I hiked into the Grand Canyon for several days. I'd love to visit again with the pups to do some hiking along the rim. I'd also love to explore Lost Dutchman State Park. Actually, I've got several Arizona State Parks on my list for fall day trips or overnights. I even bought their park pass since we're out at Catalina State Park so much. What a wonderful list of places! Ia am pinning this to keep for future use and to share! Thanks! I love that so many parks are dog friendly. To me it says that society is gaining more respect for pets and is recognizing they are indeed family members. Thanks for great info!